As a painter, you’re an expert in taking something unfinished and transforming it. Whether you specialize in painting houses or are known for your ability to make a room pop with color, when you arrive and when you leave a job, the site looks completely different. Finally, there’s painting business insurance that’s crafted to meet your needs, just the way you meet your customers’ individual demands. 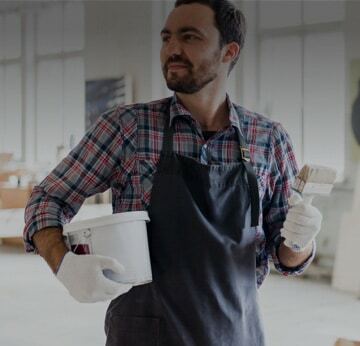 It’s designed to offer what you need for your painting business insurance, to enable you to work on that business with the confidence of great coverage behind you. You’re looking for liability insurance for painters that’s going to be easy to figure out, fit within your budget, and offer all the coverage you need, with no extras? You’ve come to the right place. And the really good news is that it takes no phone calls, no faxes, no meetings. Most of our customers can get their quote for insurance for painting contractors in about eight minutes and then buy their painters liability insurance quickly, 100% online. What are you waiting for? Why Do I Need Painting Contractor Insurance? As a painter, you have a lot of responsibilities. In addition to finding work, buying supplies, and managing invoices, you need to do a top-notch job, with the results customers demand, each and every time. That being said, sometimes, the unanticipated happens. People slip, sometimes a client’s vase may break. Some clients may even demand to see a proper certificate of insurance before working with you, to ensure you’re a true professional. These are just some of the reasons why you need proper painter insurance. With painter liability insurance, you don’t have to worry about being asked for proof of insurance, or even accidental spills along the way. Buying insurance for painters frees you up, giving you the confidence to get on with running your business. Why Is Next Insurance Right for My Painting Insurance? As you know, there’s plenty of choice out there when it comes to choosing business insurance for painters. What you need is reliable painting company insurance at a price that fits your budget. That’s why we offer tailored coverage, at a price that makes sense even if you only paint part-time. If your needs increase, you can increase your painting liability insurance coverage accordingly. Plus, it’s all extremely accessible, available directly online any time of the day or night. For added convenience, you can get Live Certificates of insurance for free, online, instantly, so potential customers don’t have to wait to see that you’re a serious professional. But don’t take our word for it; take a look at our reviews, and see for yourself what painters like you say about getting their interior painting insurance from us. What Insurance Does a Painter Need? What About Other Work I Do? While your primary work is painting, it’s possible that painting isn’t the only job you take on. You might do other jobs on the side from tiling to drywall, or even a bit of carpentry work in between. If that’s the case for you, painters insurance won’t be exactly what you need. Rather than getting liability insurance for painting contractors, you should be applying for our general contractor insurance. Just remember when filling out your application form to select all the categories of work that apply to you. If you notice that something you do isn’t listed, that means we don’t offer coverage for that activity. Get the painters liability insurance you need to to succeed on your terms. You can get your policy quickly and easily online, with no meetings, phone calls, or faxes. Fill out our quick and easy application online, and choose the plan that’s right for you. It’s so simple you can do it from your cell phone while drinking your morning coffee. "After 27 years of unfair costs and frustration dealing with insurance for my Painting Co, FINALLY these guys got it right. Thank you, you will soon dominate the market, can't wait to see that happen." "It took me 10 minutes to get insurance! Very easy process and reasonable pricing."